Dentists need to make clinical decisions based on limited scientific evidence. In clinical practice, a clinician must weigh a myriad of evidences every day. The goal of evidence-based dentistry (EBD) is to help practitioners provide their patients with optimal care. This is achieved by integrating sound research evidence with personal clinical expertise and patient values to determine the best course of treatment. The two important fields of dentistry are to be considered: (1) The knowledge (i.e., the science) and (2) the application of this knowledge (different specialties and clinical practice) to practice EBD. It relates the science to the clinical practice through the use of scientific methods to reach the best treatment for a specific clinical situation/patient. Evidence is based on the existence of at least one well-conducted randomized control trial. Sackett et al. laid the foundation of evidence-based practice by defining it as “integrating individual's clinical expertise with the best available external clinical evidence from systemic research.” According to Gray, it is an approach to decision-making in which the clinician uses the best available evidence, in consultation with the patient, to decide upon the option which suits the patient best. Mosby's Medical Dictionary has stated that EBD is “a systematic practice of dentistry in which the dentist finds, assesses, and implements methods of diagnosis and treatment on the basis of the best available current research, their clinical expertise, and the needs and preferences of the patient.” Three components of EBD are evidence, clinical expertise, and patient preferences and needs [Figure 1]. The classic example for the need for evidence is William Hunter's focal infection theory which was originally proposed in 1900, but was later discarded in 1940s due to lack of proper evidence. Again the theory was accepted in 1989, due to studies which proved the same with proper evidence. There were barriers to implementing evidence-based methods in dental practice. Incorporating EBD to clinical practice helps in formulating a clear question related to a patient problem, finding the evidence quickly and efficiently, evaluating its credibility and usefulness, and aiming to help dentists overcome the first of those barriers. The principles of EBD, finding the best information quickly when it is needed, assessing its quality and deciding whether it is relevant, will help you to use research evidence in making everyday clinical decisions. Dentistry is not just a science but also an art. It is a science because the fundamental building blocks of knowledge are based on the scientific process of research (evidence-based research) which includes basic, applied, and clinical research. It is an art as it draws on the experience and personal observation of the clinician. The basis for meaningful dental care is provided by the synthesis of scientific understanding (evidence-based research) and clinical observation. There are many benefits of applying the evidence-based method in clinical practice. Another example is the use of evidence-based approach in case of dental implants. Clinicians should exercise caution while treating patients who smoke and those with untreated periodontal disease, poor oral hygiene, and uncontrolled systematic diseases. Some restrictions must be established to conduct a search effectively; therefore, a population, intervention, comparison, and outcome (PICO) question needs to be generated. These four main areas of restriction (focusing the question) are PICO. In the above example, the PICO question is as follows: In patients with nifedipine-induced gingival overgrowth, what is the effect of scaling and root planing and periodontal resective surgery, with or without cessation of nifedipine on probing depth, gingival size, and recurrence of overgrowth? After the PICO question is formulated, a search protocol can be initiated. In a systematic review, the search protocol is a search strategy that is developed and strictly followed so that the results can be standardized and reproducible. The search should be started by searching preappraised literature before performing database searches for primary literature. These resources provide analyses and grading of the evidence, which may eliminate the need for more extensive searching. The main evidence-based resources for dentistry are the American Dental Association Database of Systematic Reviews (topic index); the Journal of Evidence-Based Dental Practice; the Cochrane Library; and EBD. The search terms should be related to all the four parts of the PICO question. Before the results can be analyzed, the quality of the studies must be considered. Publications can be stratified according to their study design. Meta-analyses and systematic reviews are considered to have the highest level of evidence because the protocols are planned and applied prospectively. Consideration of the evidence is not necessary to make a clinical decision. As discussed before, the scientific evidence has to be considered, along with patient preferences or values, clinical patient circumstances, and the practitioners' experience and judgment. Randomization eliminates allocation bias. In theory, randomization ensures that variables, over which the study has control and the unknown variables that come into play in all studies, are equally distributed among the test groups. It is critical that all patients who enter a trial are properly accounted for at its conclusion. One must include the dropouts in the statistical analysis. Were patients, their clinicians, and study personnel blinded to treatment? Blinding means that someone was not aware of the treatment being rendered. Double-blinded means that both the evaluators and the patients were unaware of the therapy being rendered. To ensure validity, it is critical that the cohorts (groups) must be similar in all pertinent demographic, medical, and dental factors. Although in a large study, randomization should ensure equivalence, it is the investigators responsibility to assess equivalence among cohorts in detail. The reader must decide whether all clinically important outcomes have been considered. More commonly, the investigation might evaluate only two of the factors. Some clinicians would find the study adequate, other readers might not. Too often, a study is not long enough to be valid to the clinician (chronology bias). Although a 1-year follow-up may be sufficient in a study of the efficacy of tetracycline-impregnated cord, the same follow-up time is not adequate in a study on a new composite resin restoration. Will the results help clinicians in caring for their patients? The critical question for clinicians is whether the results will help them provide better care for their patients because that question involves all the others. If the methodology is good, if the statistically significant results have clinical relevance, and if the data interpretation is rational, one would lean toward accepting the study and vice versa. EBD is not a veil to mask the same old, inadequate research. As the profession of dentistry becomes more sophisticated, researchers and lecturers will be forced to grow also. EBD does not take the clinical decisions out of clinicians' hands and put them into the hands of literature. In fact, the opposite is true. EBD gives guidelines for the clinician and relies first on clinical expertise. EBD does not mean that third parties will control dental practices. In fact, educated dentists, understanding the literature, will be able to prevent the misrepresention of data by commercial interests. EBD does not mean that the clinician need not study basic and dental material sciences. In fact, the opposite is true. To evaluate the research presented, clinicians need a solid background on which to base their evaluations and decisions. EBD does not mean clinicians abandon everything they learned in dental school. It does not force clinicians to go backward to justify things the profession universally accepts. Who Benefits from Evidence-Based Dentistry? Researchers will be benefited by being called upon to do the clinical testing necessary before new products are placed on the market. To practice in an EBD manner, practitioners must be able to formulate a clear question, find the best available evidence efficiently, evaluate the evidence systematically, and if it is relevant and credible, apply the results of the appraisal to their practice. Materials, instruments, techniques, and therapies change so fast that most of us have difficulty in keeping up with their names, much less the details of their use. As electronic technology (Internet, CD-ROM, and DVD) expands, information retrieval is increasingly easy. Patients have access to the same data that doctors do in many cases, and as their knowledge levels increase, so do their expectations and demands. EBD closes the gap between clinical research and real world dental practice and provides dentists with powerful tools to interpret and apply research findings. EBD process is not a rigid methodological evaluation of scientific evidence that dictates what practitioners should or should not do. 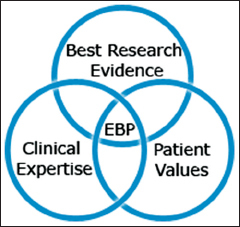 Rather, the EBD process is based on integrating the scientific basis for clinical care, using thorough, unbiased reviews and the best available scientific evidence at any one time, with clinical and patient factors to make the best possible decision(s) about appropriate health care for specific clinical circumstances. EBD relies on the role of individual professional judgment in this process. Good quality information helps to support the patient management process. Having the best quality evidence available for practice does not make treatment decisions automatic. In health care, intervention is hard, but dissemination is even harder. According to Kwok et al., research and clinical practice are often considered different disciplines that are usually not discussed in the same context. In reality, the two disciplines are inter-related and cannot be separated. Research principles need to be applied clinically to gather evidence, and clinical practice needs research evidence to justify treatment decisions. In practice, clinicians are frequently faced with situations that warrant research to rationalize treatment. The evidence-based systematic review method provides several advantages compared with a narrative literature review that is sometimes biased by the reviewer's personal experience. Second, it uses transparent methodology and is thorough and comprehensive. As discussed earlier by formulating PICO question after a query is identified, literature search can be more systematic and repeatable. The PICO question also helps to analyze different parts of a query objectively. After search is conducted, the results are ranked according to the level and strength of evidence. Moreover, patients' needs and preferences are also considered with the results of the study. This is the most important process of evidence-based practice as it is more meaningful if the results are applied to the original clinical situation. EBD requires that the practitioners question and think about what they are doing, particularly in this era of expectation that dentists will keep abreast of new techniques and developments. Information needs to be assessed, and its validity must be determined. To practice EBD properly, time must be spent in searching and assessing the literature, and information from any source should be questioned. By formulating a clinical question, carrying out an efficient literature search, evaluating the literature, and when appropriate, applying it to patient care, dentists can meet the challenges of continuing to provide quality care in a rapidly changing environment. Additional benefits are that it makes it easier to justify treatment decisions, especially when there is a complaint or a dento-legal issue. As a global movement in all the disciplines of health sciences, evidence-based care represents a shift in the practice–judgment based on scientific evidence overpowering blind adherence to rules. EBD approach empowers clinicians to question and consider the use of the current best evidence in decision-making on the management of individual patients. It offers many benefits, ranging from more efficient and effective health care delivery to improve treatment standards and outcomes. Hackshaw AK, Paul EA, Davenport ES. Evidence-based dentistry: What is it and how to practice it. In: Hackshaw AK, Paul EA, Davenport ES, editors. Evidence-Based Dentistry – An Introduction. Oxford: Blackwell Munksgaard; 2006. 1-9. Celie R, Sutherland SE. Evidence – Based dentistry: Do we know what it means? Acta Stomatol Croat 2003;37:195-8. Bader J, Ismali A, Clarkson J. Evidence-based dentistry and the dental research community. J Dent Res 1999;78:1480-3. Nainar SM. Evidence-based dental care – A concept review. Pediatr Dent 1998;20:418-21. Sackett DA, Strauss SE, Richardson WS. Evidence-Based Medicine: How to Practice and Teach EBM. London: Churchill Livingstone; 2000. Gray JA. Evidence Based Dental Health Care. Edinburgh: Churchill, Living Stone; 1997. p. 97. Pourabbas R. Evidence-based periodontology: From knowledge and attitude to practice. J Periodontol Implant Dent 2012;4:1. Anderson JD. Evidence based dental practice. The question. Dent Clin North Am 2002;46:11-9. Mealey BL, Klokkevold PR. Periodontal medicine: Impact of periodontal infection on systemic health. In: Carranza's Clinical Periodontology. Vol. 10. Saunders; 2006. p. 313. Newman M, Caton J, Gunsolly J. Evidence-based periodontology. Ann Periodontol 2003;8:1. Daly B, Batchelor P, Treasure E. Essential Dental Public Health. New York: Oxford University Press; 2002. Newman MG, Takei HH, Carranza FA. Carranza Clinical Periodontology. 10th ed. St. Louis, MO: Saunders/Elsevier; 2006. Katzung B. Basic and Clinical Pharmacology. 6th ed. Connecticut: Appleton and Lange; 1995. Fujii A, Matsumoto H, Nakao S, Teshigawara H, Akimoto Y. Effect of calcium-channel blockers on cell proliferation, DNA synthesis and collagen synthesis of cultured gingival fibroblasts derived from human nifedipine responders and non-responders. Arch Oral Biol 1994;39:99-104. Seymour RA, Preshaw PM, Thomason JM, Ellis JS, Steele JG. Cardiovascular diseases and periodontology. J Clin Periodontol 2003;30:279-92. Thomason JM, Seymour RA, Ellis JS, Kelly PJ, Parry G, Dark J, et al. Determinants of gingival overgrowth severity in organ transplant patients. An examination of the rôle of HLA phenotype. J Clin Periodontol 1996;23:628-34. Hallmon WW, Rossmann JA. The role of drugs in the pathogenesis of gingival overgrowth. A collective review of current concepts. Periodontol 2000 1999;21:176-96. Centre for Reviews and Dissemination. Systematic Reviews: CRD_s Guidance for Undertaking Reviews in health Care. York: University of York; 2009. Available from: http://www.york.ac.uk/inst/crd/pdf/Systematic_Reviews.pdf. [Last accessed on 2012 Mar 01]. Gillette J. Striving for excellence with evidence-based dentistry. J Evid Based Dent Pract 2009;9:125-8. American Dental Association. Center for Evidence-Based Dentistry. Available from: http://www.ebd.ada.org/SystematicReviews.aspx. [Last accessed on 2012 Mar 01]. Journal of Evidence Based Dental Practice. Available from: http://www.sciencedirect.com/science/journal/15323382. [Last accessed on 2012 Mar 01]. Evidence Based Dentistry. Available from: http://www.nature.com/ebd/index.html. [Last accessed on 2012 Mar 01]. Goldstein GR. What is evidence based dentistry? Dent Clin North Am 2002;46:1-9, v.
Kwok V, Caton JG, Polson AM, Hunter PG. Application of evidence-based dentistry: From research to clinical periodontal practice. Periodontol 2000 2012;59:61-74.